2009 was a difficult year. After the twisted ankle in the Spring, I had a hysterectomy in the Fall. My CFS symptoms have been waxing & waning a lot & have kept me from doing a lot of things. I've missed blogging. I'm hoping to be able to get back to it more often in 2010. Just came across this video today & thought I'd share. 1/22/10: I was just looking at this again & I realized I didn't say what I would do if I were no longer sick. SO here's my list of things I would do: Join the roller derby team, rock climb, run Bloomsday, get a tattoo, join a gym, do one of those hook suspensions, clean my house, work in the studio 8 hours a day, be a real gardener with an amazing flower & veggie garden, take the burden off of my husband, visit friends more, leave the house on my own, skydive, turn the studio into a real live business which would mean also having the clarity to do all the business stuff & etsy stuff, sketch everyday, create everyday, travel, be a better wife & mom, read more. That's all I can think of right now. Hi Everyone! Bet you wondered where I went. LOL Well, I'm back!!! My jewelry is being shown as part of a holiday art show opening on First Friday in Spokane, WA at Manic Moon Studios, 1625 N. Monroe Street, below the Lillian Con Antique Gallery. Click on graphic for more info. I bet you're wondering where I've been...Well, here's the short story (because the long story is not very interesting)...Remember that whole ankle thing? First it got better, then it got worse...doc put me in a boot & we purchased a wheelchair so I could stay off of it ALL of the time. Doc sent me to a orthopedic surgeon & he said don't where the boot or be in the wheelchair...walk on it. OK....so I did & it's MUCH better & I'm back to a normal life (whatever "normal" is lol). SO...now for the exciting news! My daughter graduated in May & then...she begged & begged for a puppy...there were tears...those tears get me every time! Drat! So...she got a puppy. BUT...she had to buy the puppy with her own money & pay for everything the puppy needs & stay home & take care of the puppy. So far...so good. This is Calli & she's a Yorkie Shiatsu mix. She is just adorable. I signed up to blog for ME/CFS Awareness. I found this on RachelCreative's blog for the 2008 Awareness day. Here is where you can find more information about blogging for ME/CFS Awareness. May 12th was ME/CFS/FM International Awareness Day. I'm a day late, but better late than never. Below is my story. 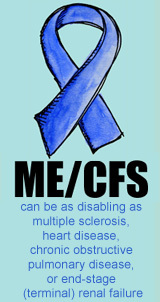 Yesterday was ME/CFS/FM Awareness Day. For many people, I think it is very difficult to understand invisible illnesses such as Chronic Fatigue Syndrome (CFS), Fibromyalgia (FM), Myalgic Encephalomyelitis (ME), Lupus, & many other 'invisible' chronic illnesses. I could tell you all about what the 'experts' say it is...what the internet says it is...I could do all of that research & tell you all the facts & figures...but today, I'm too tired to go to all that effort. The truth is...something gets lost in all those facts & figures...WE, the people living with ME/CFS/FM & other invisible illnesses get lost in all those facts & figures. So today, I will share something I do know about...my experience with CFS/FM...I know this story well. I've lived it for 10 years. Just saying that makes me tear up. I was diagnosed with Chronic Fatigue Syndrome & Fibromyalgia in 2000. However, my health challenges started a year prior in December of 1999. That December is when I got a very bad case of flu....& I never got well. It was like a light switch. One day I was well...the next, my whole life changed. Before the flu...I used to jog 2 miles at least 3 times a week...I hiked...I did anything I wanted to. Going to the store, meeting friends for a night out, playing with my daughter...all were a breeze. I never had to think about it...I just did it & lived my life. After the flu...I couldn't even walk up a flight of stairs. I was exhausted. I couldn't catch my breath. My heart pounded. Everything hurt. And that....was just the beginning of the darkest time in my life. Over the next year I struggled to finish college. I was going to school for my graphic design degree & I was determined to finish it. After all, I was probably just over tired because I was in school. I figured it would be over when I graduated, I'd take some time off, rest up, & then be ready to take on the world again. I did a lot when I was in college...I excelled for the first time in my life. I ran a student gallery, I was on the Dean's List, I got good grades & my instructors gave me great encouragement saying I had a promising future in art/graphic design. I graduated with honors in May 2000....& that...was it. In March 1998 I met my now husband, Tony. I was well when we met. Falling in love with him was easy...magical...& everything you'd imagine from one of those romantic soulmate kind of movies or novels. You know the ones...That was a very happy time. Concerts, camping & weekend trips, day trips, hiking were all part of our life. He proposed in October of 1999...Our whole future laid before us...the future looked bright...Then, I got sick December 1999. Both of our lives changed...dates now consisted of me going over to his place, watching movies, & me falling asleep with my head in his lap. Tony, has taken care of me every step of the way... He has seen me at my worst...& the worst was actually pretty horrible. He never left my side, he never treated me like a burden, & he always believed me. That's the thing about CFS/FM/ME...many times, people don't believe that you're sick. After all, you don't LOOK sick. I've heard it all...it's all in your head, you're just depressed, you're a hypochondriac, you're lazy. Comments like these are extremely hurtful to those of us who live with these kinds of illnesses. Sadly...these kinds of comments come from friends, family, & even doctors sometimes. (If your doctor ever says anything like that or says that he doesn't know what to do for you...find another doctor). This just adds to the pain of living with CFS/FM/ME...we end up questioning & doubting ourselves...we start believing that it is our fault...we feel shame & guilt...why can't we just snap out of it...maybe it is all in our head...It takes a toll on our self-esteem & our worth. I think it is pretty safe for me to say NO ONE chooses to live like this. I think one of the hardest things about illnesses like these is the isolation...not only being isolated from the world by being at home resting, but the isolation that comes from a lack of people (family, friends, doctors...) understanding that what we are living with is real. It is real. I would not wish this on my worst enemy. I have now lived with CFS/FM for 10 years. At my worst, I walked with a cane & felt 90...but I was only 37. There were weeks at a time I did not get out of bed. The fatigue was debilitating. The worst days felt like there was an assault on my body...everything hurt...like I'd been hit by a truck...or a train...I would be numb, almost zombie like...forgetful to the point I have chunks of memory missing...not able to find the right words...having to describe the round thingys that make a car move because I could not remember the word tire. Dizziness & vertigo severe enough that I couldn't (& sometimes still) can not drive...my body not moving the way I want it to...stumbling or falling...anxiety, panic attacks & depression. (A side note here about depression -- there is a difference between being depressed which causes one to feel physical symptoms...it is entirely another thing to feel so horrible that one would then become depressed. Trust me, when someone lives with a chronic painful condition for 10 years...they're not going to be in the best of moods.) There were heart palpitations which were severe enough that I went to the hospital...Irritable Bowel Syndrome, which if you have not experienced, feels like a cat is trapped in your gut clawing it's way out....Pain in every joint & muscle, exhaustion that was so bad that I didn't think I'd be able to take another breath...I couldn't sleep & when I did it was not a restful sleep...At times I felt like I was dieing. And all of the symptoms I've described are just the ones I can remember off the top of my head. A lot of those 10 years I don't even remember. Tony says it's better that way because at times it was pretty horrible. Thing is...I also don't remember things like birthdays, holidays, chunks of memories of my life, my marriage, & my daughter growing up are just gone. There have been some really good times though. Times when I felt amazing...when I'd feel like a well person again....Like I could take on the world. These times may last a day or several weeks...I cherish them...I feel hopeful that maybe that day is the first day of me being a well person. I go & do things...I treasure the moments....the sun on my face...the little things that I didn't notice when I was a well person. And at times surprisingly, my body bounces back fairly well from this burst of activity...sometimes. When a relapse sets in though...it's a cruel reminder that steals a bit of that hope that sparkled through my body just days before. This is when I have to remind myself to be patient with myself...that I am OK despite this illness that ravages my body. That things will be better. And if I can't see it...Tony reminds me of it. It takes courage to live with these illnesses I've been diagnosed with. In many ways CFS/FM has been my teacher. Before this diagnosis I was focusing on the job, the career, the bling of life...what face I showed to the world...if I was successful or not...honestly, I was shallow. Living with this illness has caused me to get real honest with myself...to go within...to unburden my heart of a lot of baggage. It has challenged me to look at who & what is important in life...what isn't...what can wait...It has taught me patients, perseverance, strength, courage, compassion...& in the end I believe that I'm a deeper, fuller person for it. I have learned to go with the flow & ride the waves of my energy levels. I have learned ways to work with & around it....not that it's always easy or that I always let things flow...after all, I'm just a work in progress. I have come to understand that I am not my illness. I will never say, "I have CFS/FM." I was diagnosed with CFS/FM...I am not CFS/FM...CFS/FM does not define me, my heart, or my spirit...it is not who I am. I have learned to live with this illness....so survive & thrive in my own way. These days, I'm focusing on doing what I love. I've always wanted to be an artist. So now, slowly but surely, I am working on creating art in my home studio. Tony converted our garage into a studio for me so I would have a space to work. (I named it MoonWillow Art Studio because we have a very old Willow tree in our front yard & the Moon passes behind it in the night sky.) The act of creating helps my healing process. It brings a spark back into my body & reminds me of the feeling of hope, of being alive. I had my first art show July 2008 at a local gallery. That was an amazing time...that was the last time I felt really good. I've been dealing with several relapses since August 2008, which slows down the progress I'd like to be making in my studio...but, that's when I remind myself that it will come in it's own time. I am making progress...after all, I no longer walk with a cane & my symptoms are less frequent & less severe. Currently I am working on opening an Etsy shop to bring my art & creative efforts to the marketplace. This is a bit of a daunting task as my brain doesn't always comprehend everything I'm reading & what I do read, I forget. It's a work in progress & sooner or later my shop will be open. I have also discovered an interest in writing. I never thought of myself as a writer, but it seems to be something that is knocking at my door these days. Whether I'm any good at, I do not know...just the process of writing is intriguing though & I'm excited to explore it more. 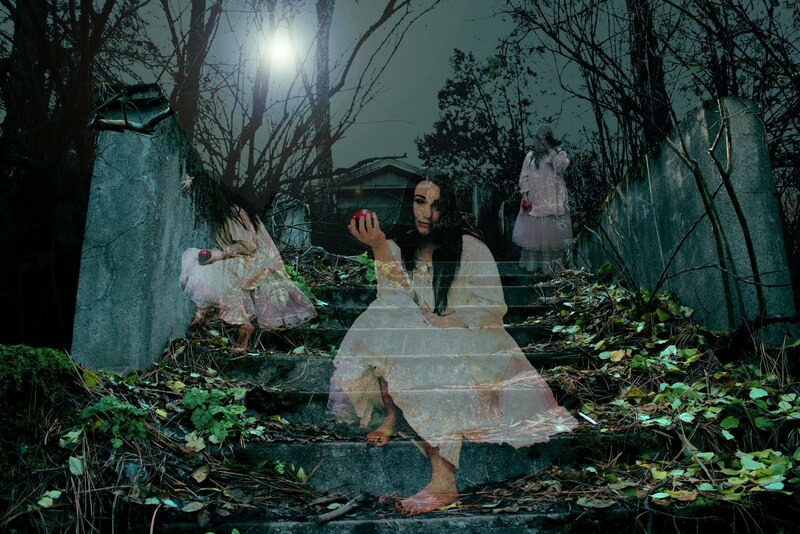 Actually, I have a couple of horror novels whirling around in my mind...we shall see if they come to be. It's something for me to look forward to. Which, I think is important for anyone living with illnesses like these. It's hard to share this much about my life with CFS/FM. This is just a bit of what I could write. I feel hesitant to publish this to my blog. The fear of not being understood or believed...What will you think? What will my friends & family think? It's embarrassing in a way...to show my soft underbelly...to admit that I struggle with this. It's not something I often talk about...at least not the sadness & suffering part of this illness. Most of the time I focus on talking about the good that has come out of this. I do my best to be a glass half full kind of gal. Revisiting the pain of CFS/FM in my life is difficult...the feelings of sadness bubbling to the surface...bringing tears to my eyes. However, if I don't talk about it...if other people with illnesses like this don't talk about it...The world will never know & we will continue to feel isolated. I hope by me sharing my story, it will bring some awareness to CFS/FM/ME & other invisible illnesses. For those of you out there that also live with these kinds of illnesses, I hope that by reading my story you know you're not alone. If you feel moved to do so, I would love to hear from you & know your story. From one survivor to another...Never, never, never give up. The world is a better place for having you in it. You have worth. This quote by Mary Anne Radmacher has gotten me through many hard days, "Courage doesn't always roar. Sometimes courage is the quiet voice at the end of the day saying, "I will try again tomorrow". Considering this is my first big outing in almost two weeks, it was an adventure for me. Yesterday we had errands to run. Had to go see the Doc to check on my ankle, which is actually doing a lot better! I'm not on crutches or using a cane at this point...just call me 'hop along'. I still can't run a marathon or go hiking or be on it for too long, but at least I can get my own coffee. We stopped for lunch at Knight's Diner. Then we popped over to Northwest Seed & Pet to buy seeds for the garden. We decided to try the heirloom seeds this year & try our hand at saving the seeds to plant for next year. I still have research to do to figure it all out, but that's part of the fun! The seeds we bought are from Ellensburg from Irish Eyes Garden Seeds. We also bought a couple blackberry plants & a couple blueberry bushes. The folks at Northwest Seed & Pet are really helpful & knowledgeable. Now we just have to plan our garden out for this year. Oil is coming along nicely. So this is why I haven't been at my computer much this last week...Tony & I went up in the woods to pick cottonwood buds. We do this every Spring. Why? I make a medicinal oil out of the sap in the buds. I use it for things like sprains, arthritis, fibro pain (note: this is not medical advice from me to you). It's not something that can be bought so I make it. It smells so good! We have a lot of good memories doing this too. It's something we look forward to every year. Went to the Doc & it's not broken...I just tore all the ligaments in my ankle. Great. Doc says to take it easy & sit on my behind for the next couple of weeks (this was a week ago yesterday). Basically, if the ligaments don't heal right...I'd be looking at surgery. So even though I'm a horrible patient & I hate just sitting, I am following doctors orders. It must be getting better though because I'm able to sit at the computer longer & longer each day. In my boredom I started taking pictures of stuff from wherever I'm sitting. Below are a few pics. Some of them I was playing with my telephoto lens. Me hanging out in the back yard while Tony stacks wood. All of the photos below were taken from me sitting here. Here's the oil I'm making from those cottonwood buds. Isn't it a gorgeous color? Another photo of my tulips coming up. Just the power lines that run down the alley. But look at that blue sky! Beautiful! You know how life just seems to get away from you sometimes? Today I'm catching up on my blog. I've been taking pictures, meaning to share them...but then life happens. I've been at my computer in brief spurts...stay tuned for my next post & I'll tell ya why. But I'm back now. Took these a couple of weeks ago around the yard. My Chives are comin' up. I even used some in the potato soup the other day. Yummy! Crocuses by my front door. Days like today I wonder if Spring & Summer will ever really get here. I don't think I can remember a time when we had snow in April. One year we did have snow on the Spring Equinox. And one Summer it may as well have been October...I was wearing fanel...in July. That Summer it rained & I actually remember a day where it was 40 degrees. That was back in the 90's. We ran out of wood last week. Tony went up to my folks property to get more. I had no idea! I'm definitely going back to good old fashioned lettuce! Last night was Earth Hour from 8:30-9:30pm. I made super yummy gluten free oatmeal raisin cookies...but I was out of brown sugar..so I used regular sugar & they turned out even better! Then I made a pot of tea before 8:30. We lit all the candles we could find in the house. It was beautiful! Tony & I were like, why don't we do this more often? We spent our time talking & then our daughter came home & got in on the action. She's 17...you'd think a teen would be like this is boring...but she really enjoyed it. When it was time to blow out the candles & go to bed, she was bummed. Cookies & tea by candlelight. Divine! You can see what time it is on the stove if you look close. This is a close up of my hanging candle holder. I got it at Goodwill...it was a chandelier light for over a dining room table. Well, I repurposed it & viola! Candle holder. See? I HAVE been working! Right on! I originally posted this on my MoonWillow Studio blog. I couldn't post it here until now because it was a gift for a friends 40th birthday...& she reads Karny Life now & then...so I just couldn't take a chance that she'd see it before I gave it to her. Actually, she did see it. She came over the other day & came through the studio door. So of course she saw it! I had to do something! So I just played it off like, 'Yeah, this is what I'm working on. It's for my new series that I'm workin' on. Whatcha think?' LOL So she was completely blown away when I gave it to her yesterday! Finally...inspiration! Yaaaayyyyyy!!! This is something kinda new for me. I'm playing with acrylics on canvas with no stretcher bars....so I guess it's more like a wall hanging...or a door hanging in this case. It's actually a mixed media piece as I'm using dry pastels, paint, stamps, ink, collage, beads, charms, & fibers. This is the first little do dah from my new series I'm working on. It's titled, "Gift For A Friend"...OK, you got me...I don't have a great name for it, but it is a gift for a friends birthday. So this one is already spoken for, but there's more to come so stay tuned! Join me in observing Earth Hour next Saturday, March 28th from 8:30pm - 9:30pm. We're planning on having a candlelight dessert & telling stories. Would love to hear what you did.